Both this record and the singer are really obscure – but if you like Otis Redding (and there can’t be many people reading this page who don’t) then finding this 45 will bring considerable pleasure. Green has clearly been listening closely to the great man, using a couple of the same stuttering phrases and a similar crying tone to his voice. 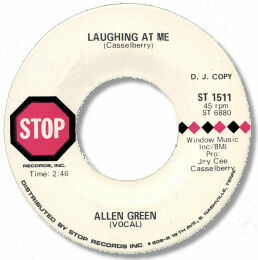 But Laughing At Me is a fine original, the backing, especially the guitarist, just right and the way the subdued horns come in about 2/3 of the way through adds the final polish to a very worthwhile deep single. Yet more proof that in amongst the country catalogues of the 60s, Nashville cut some great soul 45s. Lots more to discover yet as well.